I've just been to Agile Singapore and had a blast. What a nice bunch of people I met there! And the event was super; fun well organised and informative - that's all i want from conference. I also had an opportunity to give a presentation there. It was quite some time since I created one for scratch so I took it (the opportunity) to rewrite my Kanban In Action presentation. Some people have asked me how I create presentations and I thought that it could be good idea to write it down for myself as well. Hopefully I will do more presentations... then I can use this. I don't consider myself an expert on desimomomooahahahaaa (sorry could not keep a straight face... ok - once again...) on design of slides nor do I have deep communication education. I have failed a lot though and I really enjoy doing presentation. Below works for me - your milage may vary. I've just been to Agile Singapore and had a blast. What a nice bunch of people I met there! And the event was super; fun well organised and informative - that's all i want from conference. I also had an opportunity to give a presentation there. 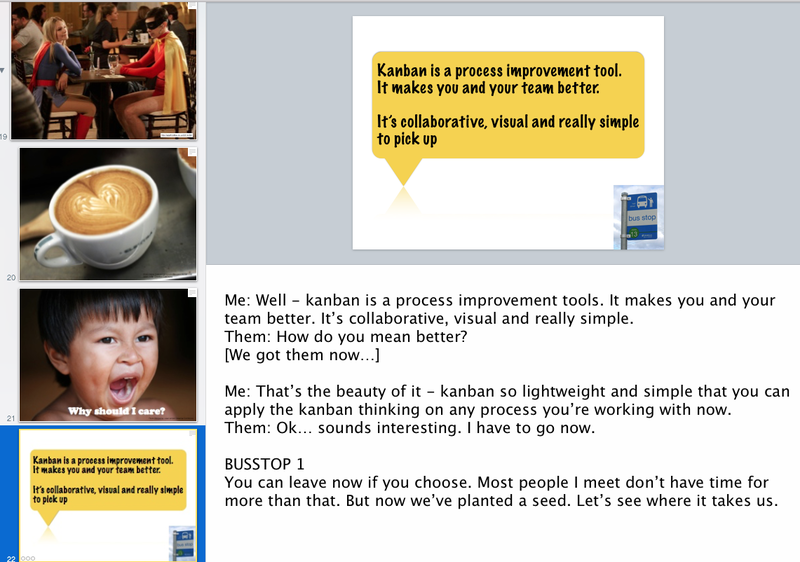 It was quite some time since I created one for scratch so I took it (the opportunity) to rewrite my Kanban In Action presentation. Some people have asked me how I create presentations and I thought that it could be good idea to write it down for myself as well. Hopefully I will do more presentations... then I can use this. I don't consider myself an expert on desimomomooahahahaaa (sorry could not keep a straight face... ok - once again...) on design of slides nor do I have deep communication education. I have failed a lot though and I really enjoy doing presentation. Below works for me - your milage may vary. I've come to notice that I work on my presentation in a number of iterations. In true lean fashion I try to produce something that would be possible to deliver as a presentation at the end of each iteration, each iteration producing something more and more polished. This has another advantage I've noticed - I takes much less effort to learn once I have the finished presentation. I have already rehearsed the presentation a number of times in my head. Meaning that the time from any step below to "ready to give presentation" should be short. Sometimes that works. Here's my rough process, sometimes I do more than one thing at the time and sometimes I skip steps. I has to do with how much time I've got. Once I have a talk coming up I usually know just the title or the theme for the talk. In this case I also had an abstract, but that's seldom the case. Let's pretend we just had a title: "Kanban in Action". Often I have a time constraint too. This is a 2 hour talk, 45 min or workshop or 10 min talk. I start to let that thought soar around my head when I'm walking or running (really good time to think I've noticed). 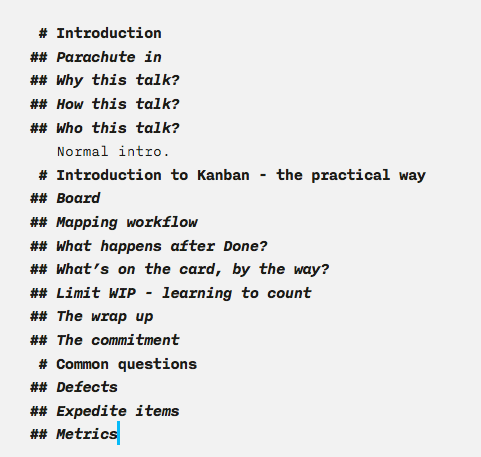 What would I want to hear around Kanban in Action in a 45 min talk? The crowd I'm meeting - what would be good for them? What should I include, what should I skip? So that means I rather do small steps often than gigant steps seldom. 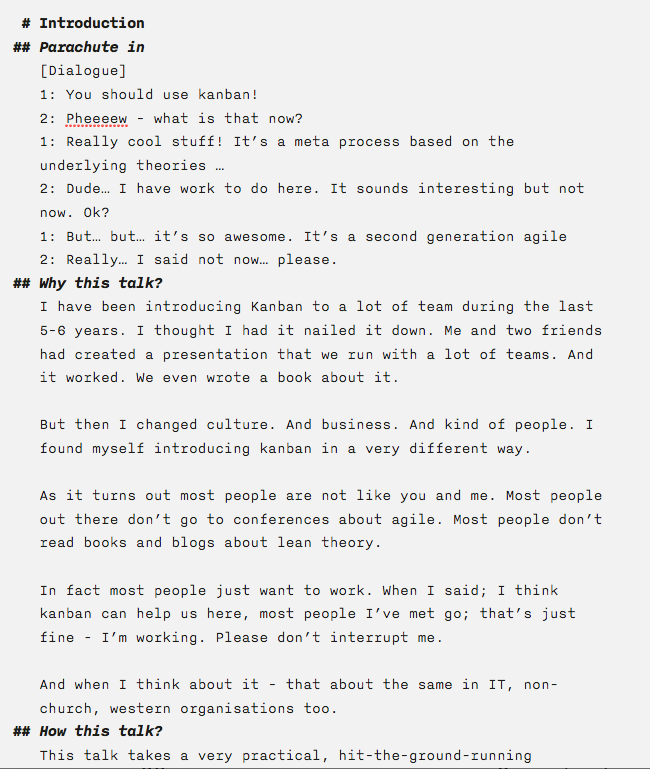 Often I end up doing run-throughs of the talk or parts of it. Just to get a feel for how I would present this. The hardest part for me here is to remember what I thought... So I usually write down some points or bullets when I get the chance, after the run for example. They are often repeated and unstructured. Doesn't matter now. I've been blogging for about 8 years now. I like to write and I type pretty fast. So my way of concretize my thoughts is to write. In this step I take my notes from the thinking and turn them into a script. I write the script in markdown in my favorite editor IaWriter. Buy it now - you will not be disappointed. First I just structure this as bullets but little-by-little I start to add content in there. The first version of the document, where I've just ordered my thoughts, probably looks something like a table of contents. Like the screen shot on the right. Often I end up just writing the entire thing out as I would say it. Like a long narrative. This is the way I think, probably from all the blogging - I just get it out there. In fact that will prove useful in a little while. Any how, a finished version of that document might look something like the extract below. Or rather exactly like that. Some of the bullets might be empty for now. But it's mostly filled out. I tend to move things around a lot in this phase. And "cut and paste" (in my mind sometimes) from other presentations I've given. Once I'm at this place I could actually give the talk as I wanted to - but without slides. Hmmm - that's a thought that I might try. But I have not yet. I like my visuals to speak together with, or at least complement my talk. So let's move on to that. It's now time to move to slides. I use Keynote but Powerpoint is of course another option. Or Prezi or some of the HTML tools. As you soon realise the way I do slides the tool doesn't matter too much. Most of the tools I've seen or use can handle my ... requirements. This is the same basic introduction I do of myself for all talks. With this I also get started pretty quickly. I don't have to set up any fonts, or decide on background color etc. I just go. It's maybe a bit boring using the same thing over and over but sometimes I get time over and redo this template. I have added a slide for title and an outro slide to. And a final black one because I go past the last slide sometimes I have a hard time getting back into the slidedeck at the right place. The first thing I do is to move all of the script I created above into the Presenter Notes of my slides. I try to split the slides into ca 1-2 min of talking. That's maybe 15 lines above. 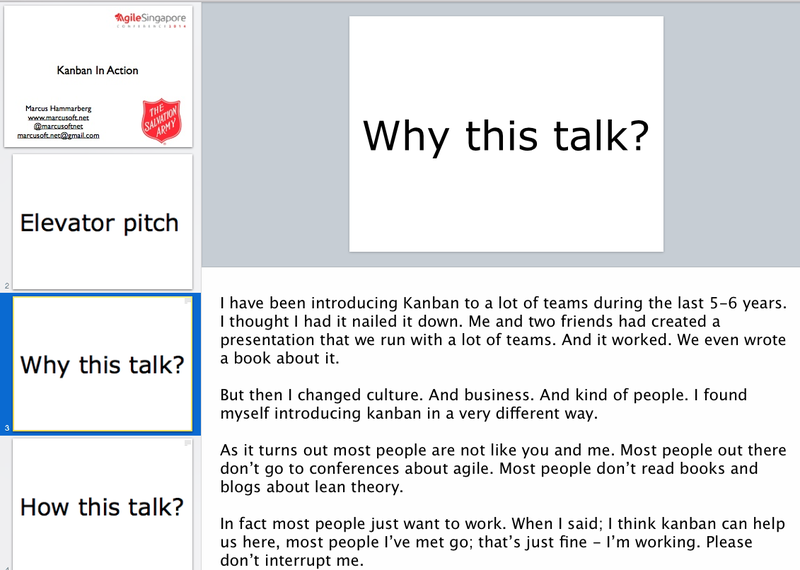 I use the blank template for all my slide (no content) and for each I try to add a single word or a short sentence that sums up what I will talk about on the slide. Limiting the presenter notes to 1-2 minutes of talk gives me quite a lot of slides, maybe 30-40 slides for the 45 minute talk. Just like I want it. Quite often I find it hard to find a single word or concept that describes the thing I talk about. 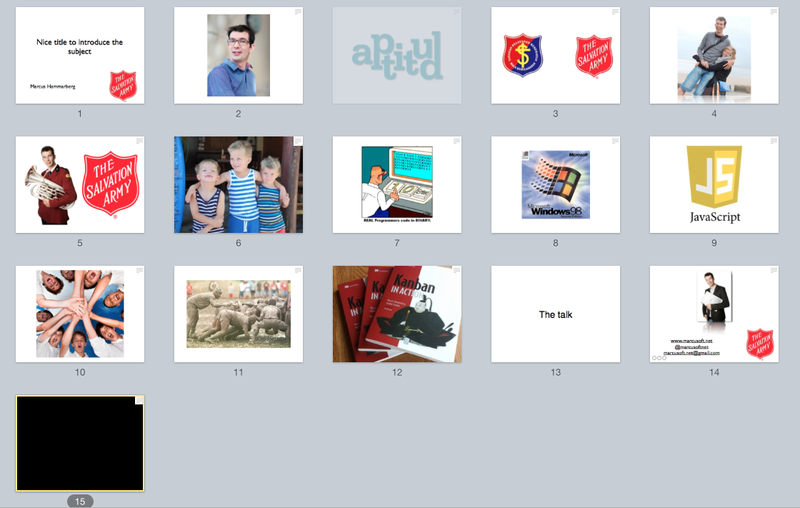 In those cases I split the slides into several, until I can find a word per slide. Giving me maybe 50 slides for 45 minutes. I sort the pictures under respectively header by moving them in under each other. In this way I can collapse and expand the pictures as needed and keep my overview even though I end up with many pictures. See the picture to the right. After this I have a completed slide deck with short, descriptive words on each slide and all of my presenter notes in the talk. I have given presentations like this. It's pretty dull but if you move fast it can be very effective too. Check out pecha kucha where people often use this technique. I can still give a pretty descent talk at this point. Try to replace the word or phrase with a single picture. 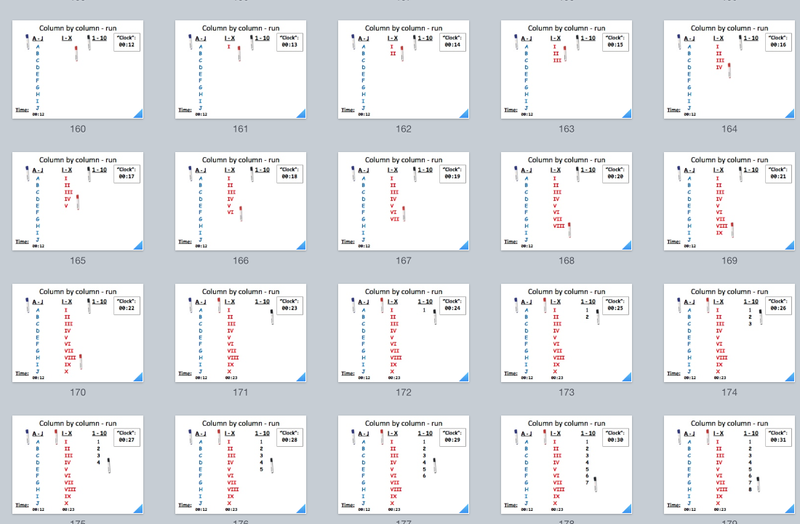 Which of course sometimes is hard to I end up splitting the slides even more. I'm not looking for perfect matches but rather something that associates the mind. For example: the "Why should I care? "-slide might have someone yawning. Make the picture big. Over the entire slide big. Too many presentations have pictures in the lower corner of a slide covered with a lot text. Don't do that! Remove the text and make the picture big and bold. At this point the presentation is more or less completed. I usually run through it a couple of times but usually that's also unnecessary since I have worked through it so many times. I know this by now. It's just to make sure that my nervosity doesn't take over. I'm not rich. Neither am I a designer nor photographer. So I have to borrow stuff from others. You can do that but you have to know what you are borrowing and how to give credit for that. I primarily use two resources for my work: Flickr and Google Images. Let's talk about Google first. It's just a subset of the normal search that returns images. All images. You cannot use all of them right off. But you can let the tool help you. There's a "Search tool" button on the page of the search result. With it you can filter to only show pictures that you can reuse. Note the different options here and then think about what you are doing. More on that below. No - you should not disregard that. It's, in worst case, stealing and in best case just rude. Which ever picture you use make sure to credit the creator. My favorite tool is Flickr. The quality of the pictures there is often much better. On their search you can also configure it to the things that you can use, under Creative Commons for example. The same rules apply - please borrow the pictures but credit the person in question properly. 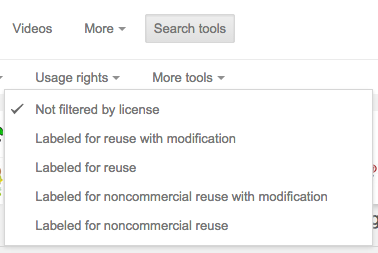 I have a link to a search with the Creative Commons filtering already set, default searching for burgers... I cannot explain why. While we're on the subject. What does those licenses mean... First you should be aware of if you are selling this material or presentation (commercial use). Secondly do you plan to modify the picture; adding to it or not. Those two properties are limited in most cases, so they are really important. Then; always credit the artist, with links to the license being use. I do it with a little box on each slide where I have a picture used under a license. Like the picture to the right. Finally - spend 5 minutes watching this. You'll thank me later and can sleep sounder knowing that you've followed the rules of the opportunity the Creative Commons, Flickr and Google Images gives us. I need to mention animations since they have been part of almost all presentations I've ever given. And helped me and Joakim to build reputation enough to get to write a book. Here is the gist on my take about animations; I avoid animations. Unless they are good. And animations are good to show progress and process. But I don't use them for flying, spinning or dropping pictures in. I frequently remove animations and duplicate slides and just move a little piece of the picture. That helps me to easier move back and forth through the animations too. Using this technique I have created animations and simulations of games that proven instructive and clarifying. Don't fret the many slides. Hide them using collapse to get the overview. During the presentation I just try to enjoy myself. Try to have fun - chances are that the people you're talking to are having more fun then. Remember that most people listening dread standing in front of others. Don't sweat that everything doesn't come out perfect. Make jokes on your own expense if something goes wrong. But don't let too many things go wrong - practice past that. Technicalities especially is one thing that should be practices past. Try the slides out - try it on a projector. And make sure you know your tool; how to configure and tweak Keynote (or what ever you use). One thought that has helped me is what been said to many couples being nervous before their wedding: One thing will not go according to plan - accept it and just live with it. It's just a presentation - it's not such a big deal after all. Make sure that you have time over for questions after the talk. If in no other way - just hang around in front afterwards and tell people you will be in the front if they have questions. I've learned so much from that. I always give a link to a download the slides on my last slide. 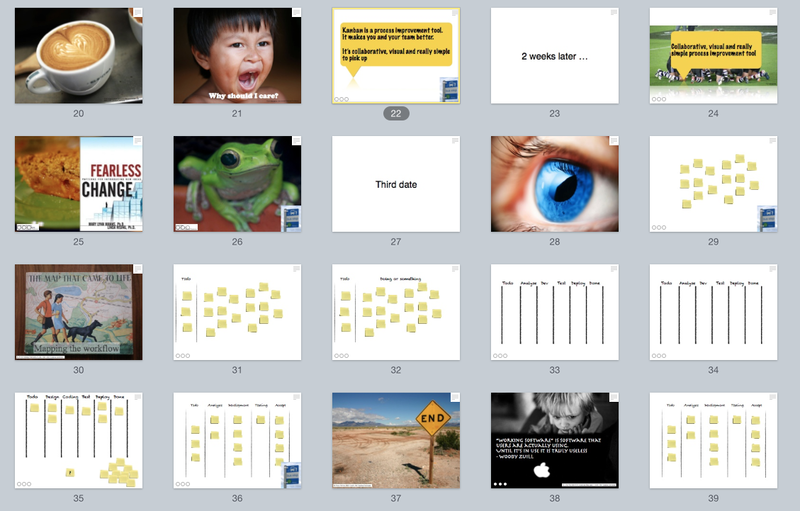 So I have to upload slides before the talk, or at least get a bit.ly-link ready. Sharing is caring. Sometimes I don't share my presenter notes but most times I share them too. My last slide always contains contact information so people can ask me questions that pops up afterwards. That's what I'm trying to do - bringing them value so that they don't feel that it was time wasted. That's the most important thing - HOW I create and deliver the presentation will most certainly change over time. This works for me, please use the parts that you like and create something better of the rest. Please tell me what you do.